These are my New Years Resolution lunch pots. They’re quick, easy and perfect for those who want to cut back on the unhealthy stuff, cut back on spending but don’t want to sacrifice their enjoyment… especially come lunch time! Throw a pot together in the evening, seal it up, pop it into the fridge and take it with you in the morning. 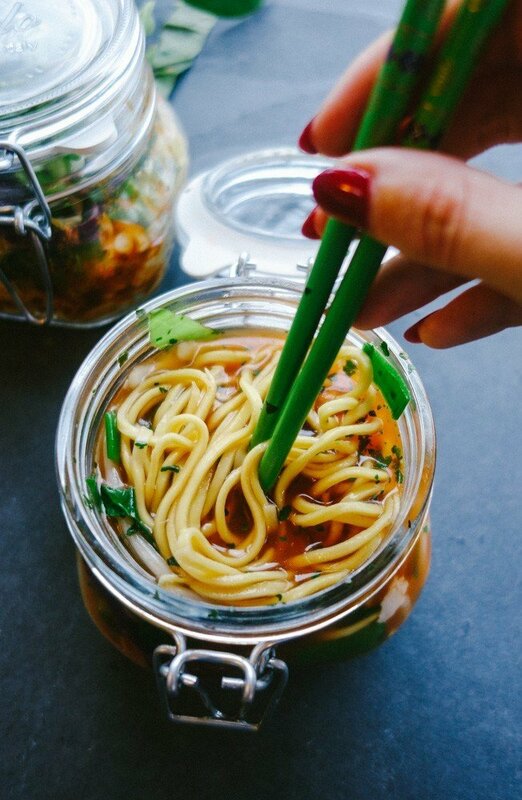 Then all you’ll need is a little hot water to bring your spicy, fragrant, healthy noodle soup to life. Scoop, spoon ‘n’ slurp to your hearts content! Warm, comforting, filling and you can use whatever you’ve got in the cupboards… so you’ll never get bored! When they’re done, pop them into the bottom of your pot. Flatten them in and make sure they’re nicely spread out. While the noodles cool, make your taste paste. In a small bowl mix together your miso, bouillon, soy, tom yum paste, as much hot sauce as you fancy. Even if you don’t like spicy stuff, just add a little. It gives the soup a great bite and boots your metabolism up a gear. Great if you get a New Year’s cold, too! Pile in your chosen meat. Use whatever you fancy, but make sure it’s cooked. Bean sprouts are heroes in the nutrition world! Bursting with vit C, B vitamins and protein. So be generous! Sprinkle in your coriander, I didn’t have any fresh so used dried. Seal it up and store in the fridge. They keep for a few days, so you could always make a batch of them for the week ahead. When you’re ready to chow, boil the kettle and pop open your pot. If you’re like me you’ll love watching the water turn that sauce you made into the most delicious, deeply red soup! When you can’t wait anymore, mix it up and tuck in. Crunchy, fresh and utterly delicious… they really are souper. You’ll never look at a supermarket sandwich the same way again! Experiment with flavours and let me know how you get on.